I was looking around for professional Photography templates for Wordpress and I came across this really nice Wordpress template. It took me a while to understand how to use it because I couldn’t figure out how the pictures were scrolling. I thought there was a bug with it, but actually it’s just user (me) error. The “Kin” Wordpress theme from Themeforest is a clean minimalistic Photography Template easily can be used to create a Photography blog, wedding photography album, video blogging, your own personal Photography album, artists album, or anything that involves lots of graphics. You can even showcase your art portfolio. Click here for more details about this theme. 1. Easy scrolling. That’s what got me. I didn’t know how to scroll across the pictures. You don’t need to click anywhere to scroll, you just move your mouse to the right side of the screen and the pictures automatically scroll to the right, and similarly on the left. 2. Add pictures or videos. In your photo galleries, you can either choose to have photos or videos. The videos scroll along like photos too. It’s really neat. 3. Deep Menus. You can have main menus with categories and drill down by category. You can have as many photo or video galleries as you want. 4. Extensive backend control. You can manage your photographs or videos easily through the Wordpress Theme control panel. You can also manage which are featured albums to show on the front page, slideshow effects, scrolling speed, image width, image height, theme colors and more. 5. Great support. You can see from the theme page there is a comments link. You can submit questions and the theme developer will answer them. He wants to maintain a good star rating so he will respond fairly quickly. So this is a great clean way to display your photographs or videos. 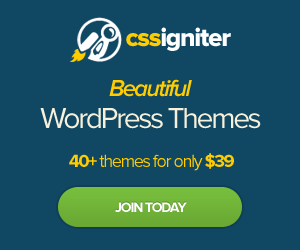 You can easily create a website like YouTube, a site like Flickr, professional wedding photography site, or a video blogging website using this WordPress theme. Click here to demo this theme. Joomla 1.6 – Where is the PDF Icon Link?